istore was created to provide small and medium sized business owners with a simple to use program that will allow them to manage their inventory more efficiently. We recognize that most business owners are not expert computer users so we designed istore to be as straightforward as we could. Whilst fulfilling this design goal we managed to pack a lot into this program. You can book stock in, book stock out, sell items, sell items with an invoice and the program keeps a tally on your levels. If any items are getting low then you will be informed allowing you to re-order in good time. In addition you can perform stock takes, handle customer returns, manage customer accounts, create kitting lists from your products, email your customers, produce a product catalogue, handle multiple locations and much, much more. If your products are bar-coded then you can use a scanner to identify them, speeding up operations. Given access to a NAS device istore can be networked together although a copy for each PC will need to be purchased to comply with the terms of the licence. 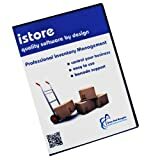 If your growing business needs to manage its inventory and keep professional records then istore is for you. This entry was posted in Software and tagged Barcode, Control, Inventory, Invoicing, istore, Management, Software, Stock by Computer Education World. Bookmark the permalink.